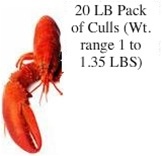 Twenty LBS of 1 Claw Cull Lobsters. (Range in wt. will vary between 1.0 Lbs to 1.35 LBS, whatever is available).